EverStone® is a blend of North America's most beautiful, natural, decorative stones, combined with our proprietary epoxy resin. EverStone can be applied to almost any structurally sound interior or exterior concrete surface, or any interior wood surface that has been properly prepared. Because EverStone is hand troweled, correcting uneven, dangerous surfaces are a breeze! Most EverStone installations only take about 2 days to complete and cause very little, to no disruption to your surroundings. Installations are free from hazardous fumes, harsh odors and messes and are California C.A.R.B. Certified. EverStone is also a great insulator, allowing air to circulate throughout the product. I will not transfer ground temperatures to your feet, like concrete or tile and has become the premier floor covering for any area that gets damp, wet or flooded. It does not mold, peel lift or discolor like carpet or tile and can be easily cleaned and maintained. 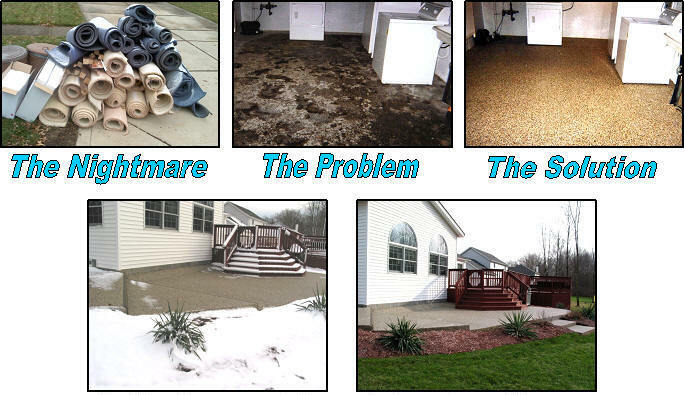 to easily drain through, eliminating unsafe, unsightly puddles! EverStone is extremely durable and can be used just about anywhere! Weather Resistant: Very resistant to ice and freezing weather conditions. Salt, calcium chloride or magnesium chloride will not damage it. Elasticity: Built in elasticity allows for most subsurface expansion and contraction. This unique property helps to limit the amount of damage that can be caused by extreme temperature changes or substrate movement. Vertical Applications: EverStone is so unique that it can be applied just about anywhere, including steps, patio edges and walls. Easy to Maintain: An occasional washing with a power washer or a carpet cleaner and a simple detergent will keep EverStone beautiful for many years. Unlimited Colors: Choose from a variety of colors or create your own custom blend or pattern. Repairable: EverStone can be repaired much easier than concrete, or tile should a ground movement crack occur over time. 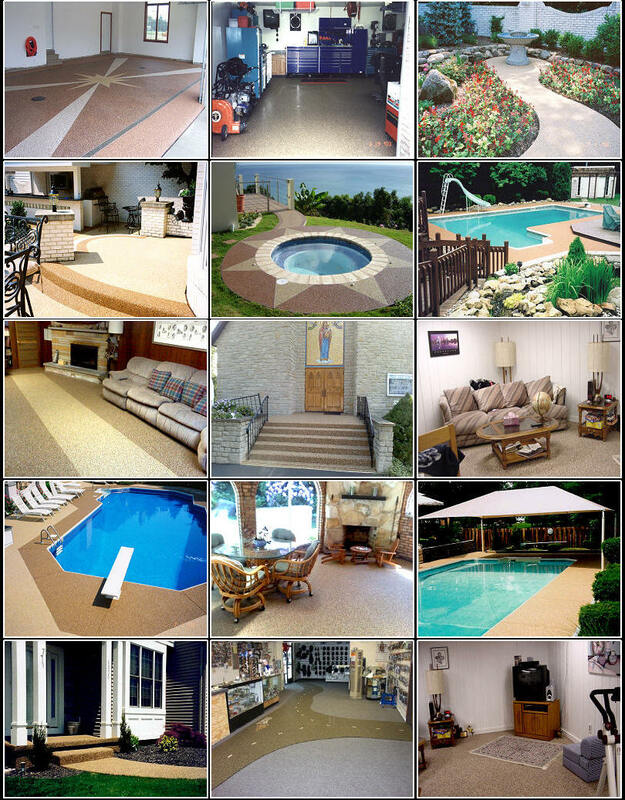 Durability: EverStone is able to support 8,000 - 10,000 pounds per square inch! Fast Installation: EverStone installs quicker and cleaner and for less money than ceramic tile, brick, slate, terrazzo, or flagstone. Most jobs are installed in one or two days!